Fashion week is officially here and already delivering some new beauty trends we're obsessing over. Though normally we opt for matte eye shadow, which is easy to blend and nearly always looks good, our trip to Who What Wear's first-ever fashion show of editor-curated looks has us rethinking everything. 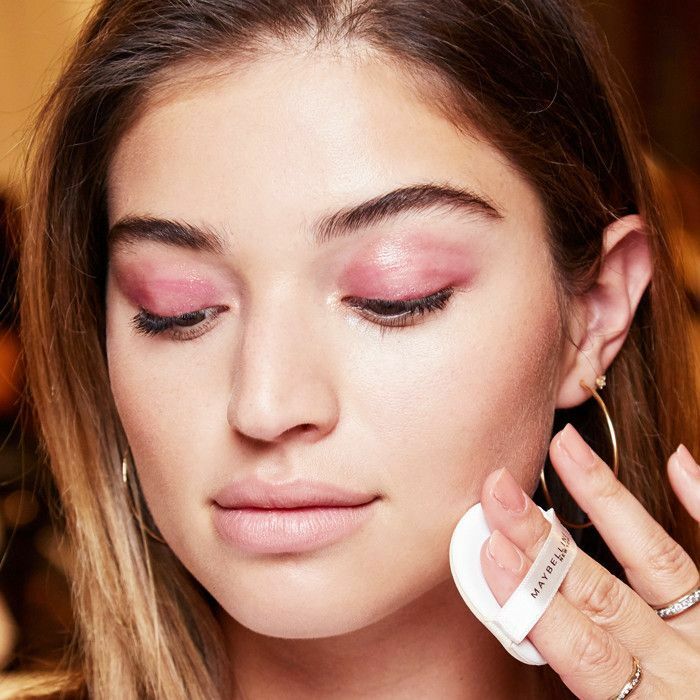 Maybelline makeup artist Carolina Dali created three looks that coordinated perfectly with the trends on the runway, but our favorite had to be the glossy, rose-colored lid. It complemented the models' fresh-faced complexions and offered the perfect amount of unexpected dewiness. We caught up with Dali backstage to find out how to get the look at home. See what she said below! Start by creating a flawless base for your skin, with a foundation or full-coverage cushion compact; Dali used Maybelline's Dream Cushion Foundation ($16) backstage and lightly fill in models' brows with the EyeStudio Brow Precise Micro Pencil ($8) for soft definition. The trick to getting the glossy look without any of the mess, Dali told us, is to create a base for your eye shadow by first applying concealer to the eyelid. Dali recommends Maybelline's Face Studio Master Camouflage Palette ($10) for best results. Then, dust a sheer translucent powder over the base with a small fluffy eye shadow brush before applying your shadow of choice. The key to ensuring this look lasts is adding the gloss as the very last step, right before leaving the house—this will ensure it's still slick by the time you arrive at your event (or, like, brunch). You can use any clear lip gloss on your lids, but at the show, Dali used Maybelline's Lip Studio Shine Shot ($6) for the lacquered effect. Finish the look with a coat of mascara, and you're officially glossed to go. For more tricks from top makeup artists, check out these tips on how to look camera ready.